Horse racing is considered cruel in many places the world over. But a new form of racing has Australians all riled up and, oddly enough, it involves women in bikinis sprinting down a muddy track. ''There will be some people that raise their eyebrows, that is to be expected,'' Turf Club exec Grant Sheather said. 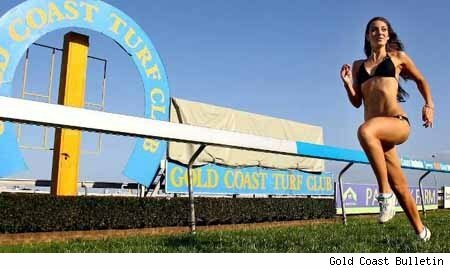 ''When people say 'Gold Coast' you think of beach, you think of girls and you think of bikinis, it's a marketing ploy to build racing." Also, the women, as far as I know, aren't being held against their will and forced to race, so is it really that cruel? No, it's probably not. Tacky, though? Most definitely.